I've got some bad news for you: the world doesn't care about your plans. Seriously. You may have all sorts of ideas, you may be excited about your grand visions, but let me tell you, nothing will come of any of these unless and until you take action. You have to understand that the world only cares about one thing and one thing alone: results. 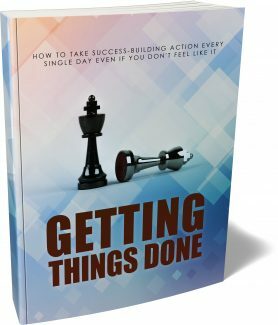 The world is always asking: Can you get things done? Can you do the big things in your life that truly matter? Everything else doesn't matter. Sadly, most people fail to take action on the big things... because they are having a tough time with the small stuff. As you probably have already heard, life is what happens when you have other plans. Don't be surprised if you constantly put your big dreams and visions on the back burner. Chances are, if you're like most people, you end up wasting a tremendous amount of your personal focus on the penny ante stuff right in front of you. You're sweating over the small stuff. But each and every day that passes is a missed opportunity to do the things that truly matter in your life. If you're like most people, you can't even manage to take care of these small things so you can free up enough time for the things that truly matter... This is why you struggle. Your big dreams remain as distant as ever because you're just so caught up with the small stuff in the here and now. If you are sick and tired of living far below your fullest potential, listen up. This book is the answer to your problems. This book will teach you to become a more effective person. Personal effectiveness means building a system that helps you do more stuff, in less time, and at higher levels of quality. Do this right and you will be able to free up enough time and motivation for the big projects that will move your life forward. Before I help you become a more effective and productive person, you have to have the right mindset. Unfortunately, it’s too easy to adopt mindsets that trip you up and sabotage your success on your path to optimal effectiveness. You need to become aware of these and eliminate them from your life. Everybody's got potential. In fact, everybody has the potential to become very wealthy. Everybody has the potential to excel at one sport or another. But the problem is, most people never live up to their potential, yet they keep celebrating the fact that they have potential for achievement. Let this sink in: do not confuse actual achievement for potential and potential for achievement. They are two totally different things. You can't just coast for the rest of your life, thanks to the realization that you have potential. Your potential is not going to do you an ounce of good unless you turn it into actual achievement and results. Please remember that your ability to do stuff erodes with time. I'm not just talking about physical action here. I'm talking about mental action as well. Scientific studies show that people's mental abilities decline with age. In fact, your IQ goes down as you get older. To think that just because you have achieved certain things in the past that you can continue to achieve them long into the future is wishful thinking. It takes more effort to maintain the same reults. And also, you would be required to learn new things so you can produce the same or better results in the future. Don't entertain the idea that just because you were able to get stuff done in the past that you will continue to perform at a similar level. It doesn't work that way. You cannot give yourself the luxury of "coasting" through life. Just because you were able to do things in the past, it doesn't mean that you only need to continue doing the same things. Conditions do change. For those achievements to take place, you have to level up your skills, you have to be adaptable, and you have to find yourself at the right time and the right place doing the right things. This means keeping up with the changing situation on the ground. Otherwise, it becomes so easy to think that since you are unable to produce the same results, then there is something wrong with the activity itself, or the industry you're in, or your career, or other people. It turns out that the only problem is your refusal to change and keep up with the times. A lot of people are under the impression that for them to be successful, they just need to find themselves at the right place, at the right time, doing the right things, with the right people around them. How come? You're not relying on your intuition. You're not relying on your gut feeling. You're definitely not relying on getting lucky. Instead, you're focusing on the personal success systems that you have built for yourself. You become more adaptable. You are able to spot opportunities as they present themselves. In other words, you learn how to do the right things at the right time to produce a predictable set of results. This is how you can tell truly successful people who may be down on their luck and people who just got lucky. I'm telling you, if you just rewind history, people who got lucky probably will not achieve the same results.